The all-time steals leader in NCAA Men’s Basketball History and Friar legend John Linehan has been named to the Hartford Hawks Men’s Basketball staff for the upcoming basketball season. Linehan moves from being an assistant coach for Brown starting in 2015 in the Ivy League to the Hartford Hawks of the America East Conference. Hartford was a paltry 9-23 last season and ranked near the bottom in the country of basically every team statistic you can. They were 310th in point per game, 314th in rebounds per game, 297th in assists per game, and 283rd in points allowed. The Hawks are losing their leading scorer, Jalen Ross (19.9 ppg), but are returning almost all of the rest of their players from last year’s team. Three guys (Jason Dunne, J.R. Lynch, & Hassan Attia) averaged at least 1 steal per game last year and Linehan can obviously help enhance that defensive prowess, especially with the guards. The assists for the team need to improve as the leading assist guy on the team only averaged 2.8 assists per game last year, which is not nearly enough. I think Linehan has the ability to drastically improve those numbers as well, something that the Hawks will need to make significant strides with as a team. Although Linehan is just getting starting on the coaching front, there has already been some Providence guards who have excelled in coaching and developing players. Obviously Billy Donovan is the first one that comes to mind in leading Florida to back-to-back National Championships but I think the more direct line to Linehan is God Shammgod. Shammgod was a incredible asset to the Providence staff while he was here and he has very translatable skills to pass to young guards. I think that John Linehan has that same ability so I’m excited to see how the Hartford guards develop this year. There was a really good quote from Linehan about the Hartford job and Hartford in general in the Hartford Courant. It would be pretty awesome to see Linehan out in the West Hartford area or perhaps at a Friar watch party around here this year. 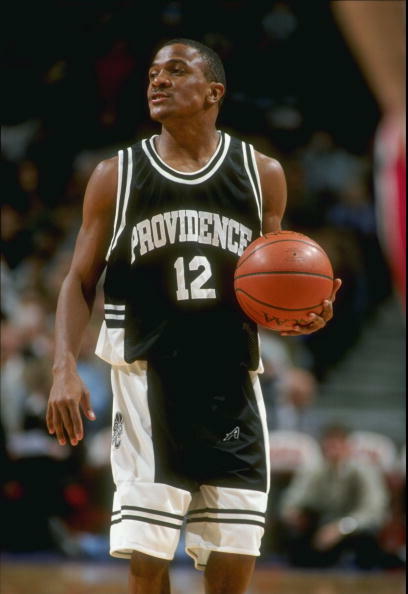 I’m thinking of starting a podcast for the Friars this year and it would be pretty damn cool to have him on in person if that comes together. I can’t write a post about John Linehan without showing off some highlights of the man. His quickness was freaking deadly.